This is a very easy dish to prepare in and is a perfect fall or winter side dish! According to the BBC you should choose a cabbage that is heavy, bright and has crisp leaves, avoid any that have puffy leaves or outer layers already removed. To prepare your red cabbage you need to first remove the tough outer leaves. Then you need to remove the white inner core, it’s hard and you don’t want to eat that part. You can slice it with a large sharp knife, or you can put large wedges of it into your food processor with the slicing blade and shred it like that if you prefer. You don’t want to cut it too small, it doesn’t need to be sliced as small as you would have for slaw mix so make the pieces a little bigger. 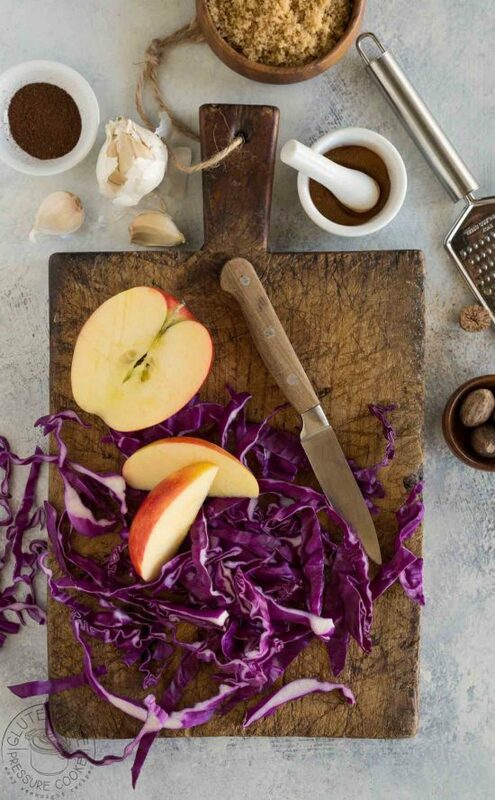 Once you have all the other ingredients prepared including the onions and apple, you can start by adding the liquids to the inner pot of your Instant Pot or other electric pressure cooker, and then simply layering the ingredients bit by bit until the are all in the pot, full and detailed directions are in the recipe below. I don’t know about you, but growing up I really didn’t rate cabbage. Mostly because I associated it with bad school dinners where the cabbage was always overcooked and not something anyone wanted for lunch! 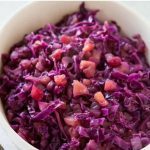 Despite being much maligned, red cabbage is full of healthy immune system boosting vitamin C, high in antioxidants and inflammation-fighting phytonutrients, and vitamin K.
It also is a great food for those of us who need help promoting a healthy gut (that’s me!). 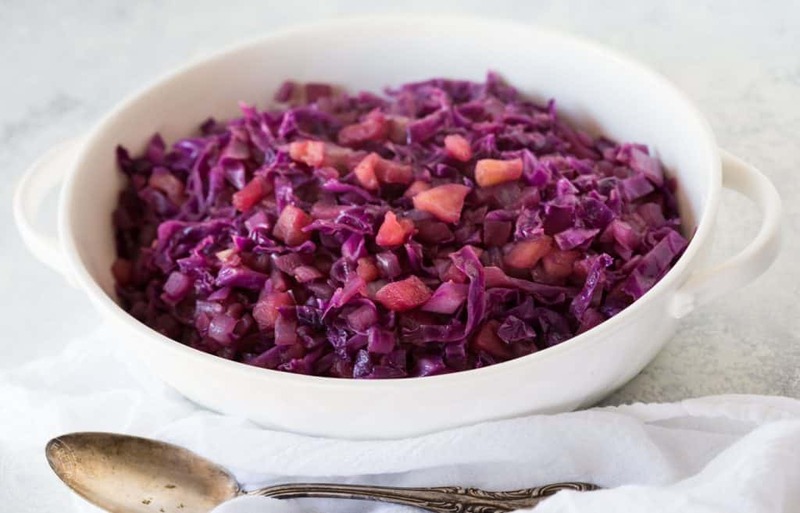 I’ve made sauerkraut with it in the past and it was particularly nice that way and also had the benefit of being packed full of natural healthy probiotics. 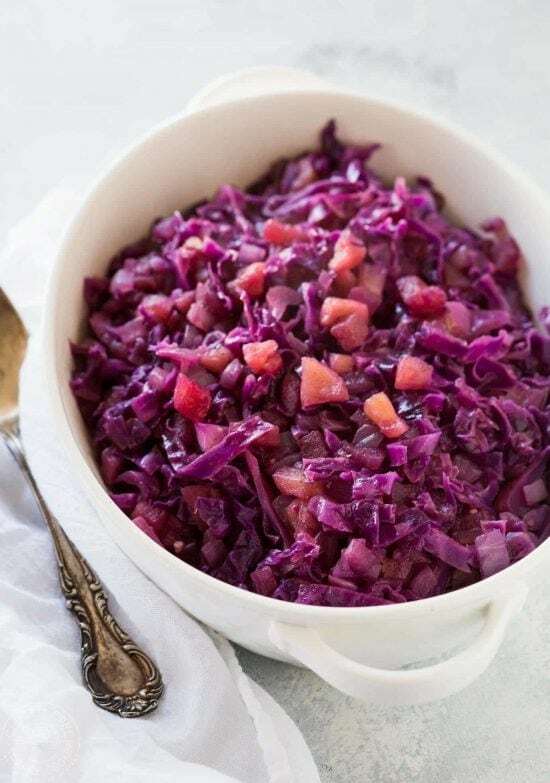 I love to serve my red cabbage and apple recipe with pot roasts or my Instant Pot Whole chicken, it’s just a little different from plain old cabbage! It would also be fabulous with any type of meat dish such as Company Pot Roast, Pulled Pork, or Cilantro Lime Chicken. To make this recipe you’ll need an electric pressure cooker, I have the Instant Pot Duo 6QT multi functional Pressure Cooker and I really love it, especially the fact that it has a stainless steel insert instead of non stick like some other brands. While I mostly use it as a pressure cooker (I love to get my dinners on the table FAST!) it can also double up as a rice cooker, a slow cooker, a yoghurt maker, and a steamer. I’ve been making myPressure Cooker Korean Beef Short Ribs for years in the slow cooker but have now adapted it for the Instant Pot. My Pressure Cooker Chicken Puttanesca is one of our family favorites, I know you’ll love it to. MyPressure Cooker Beef Bourguignonis such an easy recipe to try, I think you’ll love it, it’s a rich, easy stew that works perfectly in your Instant Pot or Pressure Cooker. An easy side dish that goes well with all sorts of main course meals! First discard the tough outer leaves of the cabbage, cut it into quarters and remove the hard stalk. Next shred the rest of the cabbage using a sharp knife, or you can add large wedges to your food processor and use the slicing blade to shred it. In your Instant Pot or other electric pressure cooker add the water and wine vinegar to the inner pot. Then layer first some of the cabbage, season with a little salt and pepper, then add a little of the apple, onion, spices, garlic, sugar, and then layer again with more cabbage and continue until you've added all the ingredients. If you are following the paleo diet you can omit the sugar and add honey after it's cooked. Lock the lid, turn the steam vent to 'sealing' and using the manual setting, adjust it to cook for 5 minutes at High Pressure. When the cook time time is up you can immediately open the steam vent (turn it to 'venting'), when all the pressure is released and the pressure valve has dropped you can then open the lid and stir the cabbage mixture well. If you are following the paleo diet and have omitted the sugar then you can add the honey at this point and stir it in while the cabbage is hot. Add in a little butter or dairy free margarine if desired, serve hot. 1/4 ground cloves? Is that suppose to be 1/4 tsp ground cloves? Hi! yes, good catch! it’s 1/4 tsp and I’ve just updated it in the post. This is so delicious, probably the most commonly prepared pressure cooker meal in our home lately! Thank you for sharing! I’m so glad you like it Ashley! 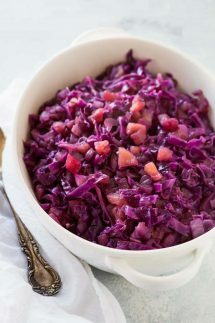 I’ve never cooked with red cabbage although we do make an awesome coleslaw with it. The touch of apples really would give it a deeper flavor. There are so many great recipes out there with slow cookers and insta-pots I’m going to have to break down and get one. I love red cabbage right now. Might this work in a rice cooker? I need to bring a dish for a roast dinner this weekend and am low on time and ingredients in China. I don’t have cloves, but have 5-spice and want to use maple syrup instead of sugar too. apologies for the delay in responding as I’ve been out of town. I don’t know if you tried it in a rice cooker and I’ve no idea if it would work in there. I do know you can braise it in the oven at 300°F (150°C) in a casserole dish or oven proof pan with a tight fitting lid for about 2- 2.5hrs. I hope that helps! Good recipe! I had a head of cabbage in the fridge and some ground pork. I was thinking that I needed to revise a relatively healthy red cabbage/apple recipe and add in the pork. I chose yours and it worked great. I browned the pork 1st, then followed your recipe guidelines. I added caraway seed (1/2 teas), some dried cranberries and used apple cider (more like a cup or so I think) instead of the water. I nixed the cinnamon because of the cider. It was delicious and SO easy in the pressure cooker! Thanks for your healthy recipes! Jackie, the pork sounds like a wonderful addition to this recipe and I LOVE the idea of the caraway seeds with it, just perfect! A 5-star recipe for sure! 1/4 whole nutmeg should also be 1/4 tsp I think. Thank you Jeff, I updated the measurement. My German mamma always made this with bacon and apples. Yum. I’m not much of a chef, but I just made this and it was delicious. Many thanks. I used mulled wine instead of water! Yummy. Would have given a five star rating but my cabbage was basically mush with the five minutes. I think 3-4 min might be a better way to go because you can always add time but can’t take away. Overall though flavor was absolutely delicious and plan to make again. Thanks for the recipe.